The twins have announced they will not be playing their senior season at UNLV but they still hope to end up playing for the Las Vegas Aces in 2019. Their reason for skipping their final year is the restrictions places on them by the NCAA. Does anyone think they have a shot at plaing in the WNBA? They already missed the 2017-18 season, so now they're also going to miss 2018-19. Let's see, 28.8% and 32.8% career shooters from a mid-major school who haven't played competitive basketball in two seasons and previously bailed on Kansas now think they can impress Laimbeer. Snowball's chance in hell is probably generous. TMZ had pictures of them at the beach in August 2017, and refers to them as former college basketball players. TMZ has had 6 articles/posts which mention or are about the Gonzalez twins, all from the summer of 2017. Yeah, only 1 seemed to get any playing time at Kansas but neither seemed like potential WNBA players. Found this article in the Las Vegas Review-Journal that says they decided to forego their red-shirt senior season (2017-2018) in May of 2017 after they had just graduated from UNLV. It says what the Slam article said - they wanted to pursue a music career and couldn't do both. Seems like the Slam article gives the false impression due to the 2018 reporting, that they are forgoing 2018-2019 when it was actually 2017-2018 that was their foregone red-shirt senior season. These girls are instagram models that were ok at basketball. They be dillusional. Will LV extend a training camp invite to them for publicity? Or is that bad, distracting publicity? And I think I'd like to start at quarterback for the Packers next year. Will they make a WNBA roster? I would not bet on that. They do have the QUALITIES to be Beyonce' background dancers. They both have triple D attributes. When the WNBA doesn't work out, they can become the next Kardashian clan. The have the cosmetic surgery and self promotion locked down. 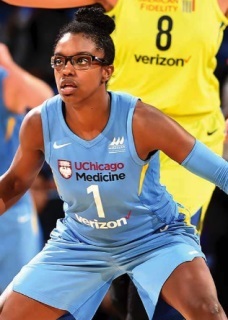 I suspect this whole WNBA thing is a stunt to try to convey "Hey, take us seriously. We're more than Instagram models. Really. We're not kidding." Actually, you should watch the little practice video on that article. It's a hoot. Reminds me of my 5th grade CYO league practice many many moons ago. Although we might have been better than this in 5th grade. Any look up their stats from when they played? Pretty mediocre. If the WNBA had a G-League, they probably won't make a roster. But the WNBA could make use of their massive social media following. The twins acknowledge that they haven’t fully tapped into the voice that they’ve developed, but that doesn’t mean they won’t. I doubt they even get a training camp invite. They need to go away. If they want to use their social media influence maybe they should go to games and post about it. Hire them as sideline interviewers. Holly Rowe has 106K twitter followers but I don't think she has an Instagram account. Or hire them for the broadcast booth. Or they could do a synchronized pole dancing act during half time. Some of these comments are brutal. Do these commenters know these girls? I admit that I'm old-fashioned, but whatever happened to athletic ability and talent to get into the pro leagues, instead of social media exposure and reality-TV? Just because the Ball family did it, doesn't mean these Gonzalez twins should! agree. It's a bit much.